a number of AdWords enhancements to our app promotion offering as part of a broader effort to connect consumers to relevant content, both on websites and apps. Starting today, advertisers will be able to access many of the offerings on the AdMob network that we announced with more to come for search ads (beta info for app engagement) and YouTube in the coming months. We’ll share more details with you on this blog at that time. A top priority for app developers is driving installs from people most likely to use their apps. Starting today, you can use installed app category targeting on the AdMob network to find new customers who have already installed apps from related categories on Google Play or the iTunes Store (e.g., Travel, Shopping or Games). For example, an action-oriented game developer may wish to reach users who have previously installed apps from the category Action & Adventure Games. Another way to promote your app is through videos. 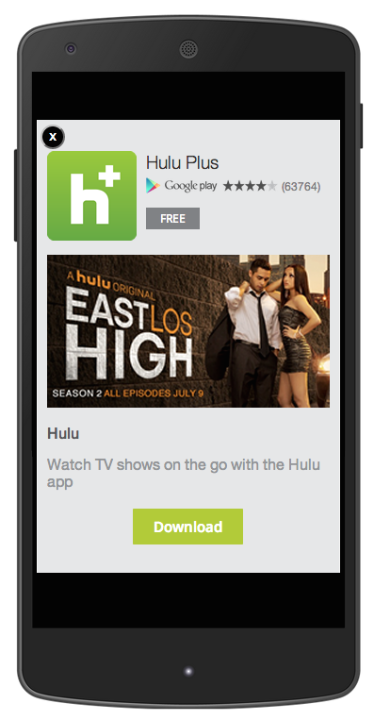 Starting today, advertisers can entice new users to their app using interstitial video ads on the AdMob network. By just entering in your video’s YouTube URL or Google Play Store listing, you can have a brand new video ad for your app! Click here to get started with these new app promotion ads using our new, simplified campaign setup flow! According to a study by Compuware, 80%-90% of all downloaded apps are used only once. Driving app users back to your app to play another game, book another vacation or watch another video are important actions in the app development lifecycle. Starting today, you can deep link to specific parts of your app directly from your ads. For example, a travel app developer may wish to reach its existing users with relevant hotel deals. When the user clicks on the ad, they will be taken directly into the app to book the hotel deal. Similarly, if you have a shopping app, you could show an ad to existing customers encouraging them to check out an upcoming sale by taking them directly to the promotion page. You can try out these app deep-linking features for the AdMob network by signing up for the beta here. Learn more. In AdWords, you are already seeing Android app installs show up as conversions. Starting today, you can use Conversion Optimizer as soon as you create your campaign to automatically find the optimal bid for your ad each time it’s eligible to appear without waiting for conversion history to accumulate. This lets you immediately maximize the total number of installs at your target CPA. Learn more. Over the coming weeks we’ll dive into these new features with tips and best practices on the Inside AdWords blog and on our Google+ page. We’re looking forward to your feedback and hearing how you are using these features to promote and drive engagement to your apps. Earlier this year, we announced a number of AdWords enhancements to our app promotion offering as part of a broader effort to connect consumers to relevant content, both on websites and apps. Starting today, advertisers will be able to access many of the offerings on the AdMob network that we announced with more to come for search ads (beta info for app engagement) and YouTube in the coming months. We’ll share more details with you on this blog at that time.